Income inequality has been on the rise on both sides of the Atlantic over the past decades, accompanied by a broad public debate about its negative consequences. Impacts on health and longevity, and the question of whether income inequality is causing inequality in health, have been a particular focus (Case and Deaton 2015). Causality could also run in the reverse direction. Mortality and morbidity are not only impacted by income differences; they also determine how productive an individual can be throughout the lifecycle and how many years of pension benefits are collected in old age. Moreover, parental income and health also impact their offspring’s health at birth, which in turn determines economic success later in life. In other words, inequality in the labour market might not only affect inequality in health – it also has the potential to feed back into income inequality and affect the starting conditions for the next generation. The strength of the connection between inequalities in health and inequalities in income is a key question. Analysing mortality trends in the US (Currie and Schwandt 2016a, 2016b) and in France (Currie et al.2018), we find that inequalities in income and health do not necessarily move in tandem, and that public policy can help to break the link. We show that the US experienced strong decreases in inequality in mortality among infants, children, and adolescents over the past decades, despite strong increases in income inequality. In France – a country with universal health care coverage that experienced recent increases in income inequality – mortality at younger ages remained equal across rich and poor areas. At older ages, mortality tends to be higher among the poor in France, but this gradient has not steepened over the past decades despite the run-up in income inequality. And compared to the US, health inequality is much lower across all ages in France. Remarkably, this high level of health equity does not come at the expense of slower innovation in health. 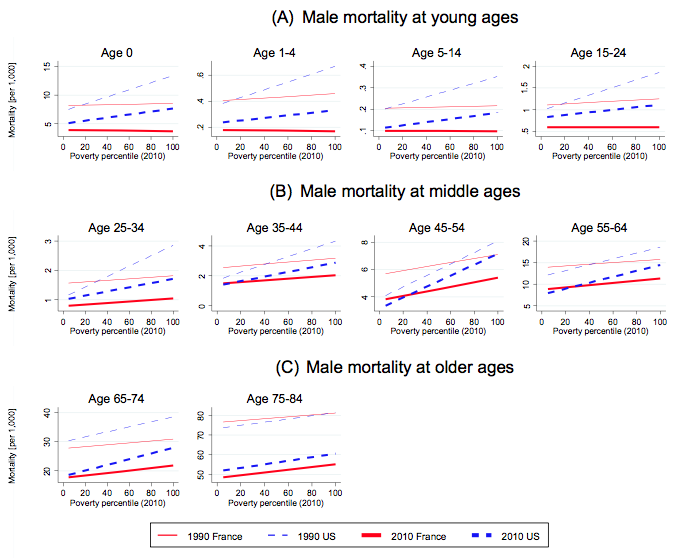 Mortality in France has improved across both poor and rich areas more strongly than in the US. Comparing mortality across socioeconomic groups over time is challenging, and even more so across countries. Many datasets do not allow researchers to directly link deaths to socioeconomic characteristics. Even when such a link is possible, socioeconomic groups often change over time, making the interpretation of observed trends difficult. For example, in the US longevity among non-Hispanic, white high school dropouts has decreased, but many fewer whites drop out of high school now than 30 years ago. The shrinking share of the group who are high school dropouts means that the remaining dropouts are more negatively selected and more likely to have had poor health in any case. These compositional changes are even more complicated when comparing different countries. Hence, comparing differential trends in mortality for socioeconomic subgroups such as the less educated between two countries is not informative. Figure 1 shows male mortality rates across poverty percentiles in the US and France, in 1990 and 2010, separately by age groups (female mortality rates, which show a similar pattern, at lower levels, are shown in Figure 2). Mortality rates are measured on the y-axis, while the x-axis indicates poverty percentiles; a place with a poverty percentile near zero is a rich place, and a place with a poverty percentile near 100 is among the poorest places. Upward-sloping graphs indicate higher mortality in poorer places. The slope of the line indicates how strong this relationship is – flatter lines indicate more equality in mortality, such that lower and flatter is better. If mortality falls over time, then we should expect to see the line representing 2010 lying below the line for 1990. Notes: Lower and flatter = better. One-year mortality rates across départementand county groups ranked by their poverty level are plotted for France and the US by age group in 1990 and 2010. Source: Currie et al. (2018). There are several remarkable patterns that jump out when looking at Figure 1. Let’s first focus on the gradients for Frances infants and young males, represented by the red lines in the upper panel. These lines are flat, which means that mortality for infants, children, and adolescents in France does not depend on whether they live in a rich or a poor area. There is no inequality in mortality at these ages, and this equity in mortality remained stable between 1990 (thin lines) and 2010 (thick lines). At the same time, mortality has strongly decreased over this time period, indicated by the parallel downward shift in the 2010 line relative to the 1990 line. At middle and older ages, a gradient appears in French mortality with people in poorer areas facing higher mortality risks. Still, strong mortality improvements occurred between 1990 and 2010 and all areas benefited similarly. The pattern for the US, shown by the dashed blue lines, is very different. There is a strong positive gradient already at young ages and inequality in mortality is higher than in France over the entire life cycle. While this can be seen as bad news, the comparison of the dashed lines for 1990 and 2010 reveals strong improvement at younger ages. Mortality decreased strongly, with the greatest improvements occurring in poorer areas. The slopes for infants, children, and adolescents are much flatter in 2010 than in 1990, despite the increase in income inequality over the same time period. Developments at middle and older ages, however, are less promising. Mortality decreased less in the US than in France, and improvements were if anything weaker in poorer areas, implying an increase in mortality inequality. Overall, these results suggest that there is no necessary connection between changes in income inequality and changes in health inequality. Despite increasing income inequality in the US and in France, the development of mortality has been very different between these two countries and across individual age groups. We identify health care systems as one central factor breaking the income-mortality link. The French health insurance system is one of the most redistributive in the world, with particularly low out-of-pocket expenditure. The lack of any mortality inequality at younger ages in France can be seen as the result of this universal availability of high-quality health care. The remaining inequalities at older ages point to the continued importance of social determinants of health that cannot be entirely compensated by health care provision, such as education, access to employment, and income support. These social factors have been recently identified as priorities in France’s national health strategy (Touraine 2014). If these factors are successfully addressed, the mortality gradients at middle and older ages might flatten further in the future. The US experienced a dramatic expansion of public health insurance over the past decades, with a particular focus on poor infants and children as well as pregnant mothers (Currie and Gruber 1996). Several recent studies directly link these health insurance expansions to improvements in infant and child mortality, and to better long-term outcomes (Brown et al. 2015, Cohodes et al. 2014, Currie et al. 2008, Miller and Wherry 2014, Wherry and Meyer 2015, Wherry et al. 2015). Other important policies targeting domestic violence and improved nutrition are equally likely to benefit children (Aizer and Currie 2014). The joint impacts of these large-scale policies targeted at disadvantaged infants and children are likely to have been key for the dramatic mortality reduction at those ages and the shrinking of the gap between rich and poor areas. As Currie and Schwandt (2016a, 2016b) argue, even some of the increasing mortality inequality observed at older ages in the US could be the result of successful social health policies. The cohorts that have entered old age over the past two decades experienced strong decreases in smoking rates that were particularly dramatic among persons of higher socioeconomic status. When the Surgeon General warned about the health risks of smoking in the 1960s, it was the wealthier parts of society who stopped smoking first, while the more disadvantaged parts of society followed that trend about a decade later. As a result, current cohorts of the elderly have experienced mortality improvements due to smoking cessation more strongly among the rich than among the poor, implying an increase in mortality inequality. However, since information about the dangers of smoking eventually reached all parts of society and smoking rates are low across the entire socioeconomic spectrum in younger cohorts, it is likely that old age mortality gaps due to smoking-related causes will decrease again once those cohorts enter retirement age. Editors’ note: A slightly edited version of this column was published on the ProMarket blog. This entry was posted in Guest Post, Health care, Income disparity on August 10, 2018 by Yves Smith. Great and useful data. Fo those, at least, who accept reducing the pain and death of mopes from “antisocial” problems as any kind of policy goal. Pretty clear that the “just die” meme is the active principle in most of the globalized world. What kind of political economy do “we” want, again? And what are “we” going to do to achieve it? If it’s not too late, for other reasons? Mopes are reluctant, en masse, to give up their consumptive lifestyle, and there are huge allocation and distribution difficulties in mass change to a different model (over the character of which there are vast options, and arguments as to what and how much, in any case). I’d love it if there were any proofs that the power elites would decline, if offered an absolute way of destroying and slaughtering the entire population of a competing state or some place where extraction of resources is “complicated” by local resistance and the costs of corruption, especially if said elites and their minions were safe from retribution or other impacts. Though the presence and primacy of people like Edward Teller and Curtis LeMay and Netanyahoo clarify that even the threat of dire, even suicidal consequences won’t deter the march of folly and idiocy.